Hello! We are two twin sisters Stephaniia and Sofi a. We were born in Sydney in a faraway Australia and live here now. Our mom and dad are from Ternopil, but they met and got married in Australia. It is a country of beautiful landscapes, trees and fl owers, animals and birds. 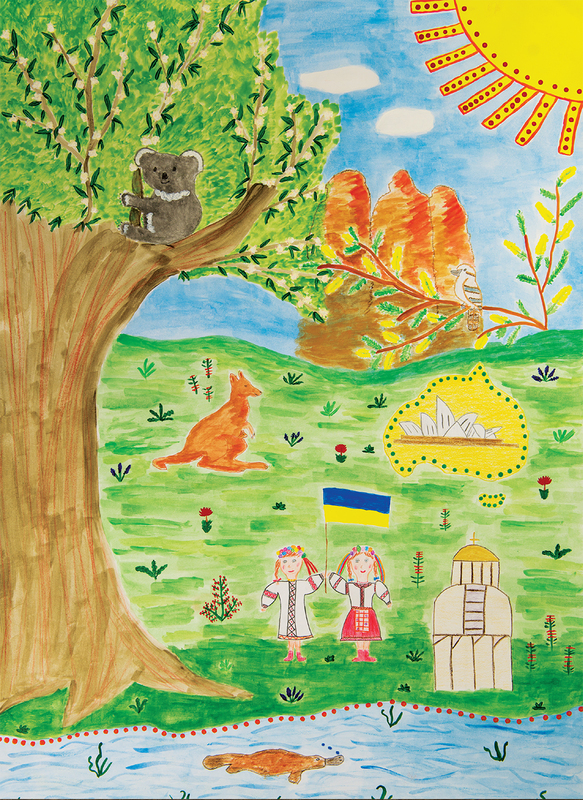 That’s why we painted our favourite places – the Three Sisters in Blue Moun- tains, the famous Sydney Opera House, the eucalyptus forest, the Nepean River, and our favorite Australian animals – koalas, kangaroos, platypus and the Kookaburra bird. We used traditional aboriginal dot painting, which is done with sticks and fi ngertips. We also depicted our St. Andrew’s Ukrainian Greek Catholic Church. The church hosts the Ukrainian school, which we have been attending every Saturday since the age of two. Our mother and older brother teach there. We often participate in various concerts, competitions and festivals, where we always show that Ukraine is a wonderful country with beautiful songs, poetry, dances, traditions and customs and that we are a part of Ukraine! We are proud to be of Ukrainian origin, and believe that Ukraine is and will always be a pros- perous, peaceful and proud European country!